The finalists for the inaugural Towards Sustainable Mining (TSM) Awards for Community Engagement and Environmental Excellence have been selected and the award winners will be announced on May 12 at the Canadian Institute of Mining, Metallurgy and Petroleum (CIM) Awards Gala at the 2014 Convention in Vancouver. The awardsâ€™ first year, a total of 25 nominations were submitted by mining companies that participate in the TSM initiative. Now in its tenth year, TSM is a performance-based program in which mining operations evaluate, manage and publicly report on critical environmental and social responsibilities. The selection committee, comprised of members from MACâ€™s national community of interest (e.g. stakeholder) advisory panel, selected the finalists based on criteria such as innovation, involvement of and engagement with communities, and project outcomes. TSM performance was also considered as an indicator of the companyâ€™s ongoing commitment to corporate responsibility. TSM Awards for Community Engagement and Environmental Excellence are intended to acknowledge innovative projects and initiatives that expand and promote sustainable development within the mining sector. For more information about the TSM Awards, please visit www.mining.ca. In response to interest to track regional grizzly bear trends, Dominion Diamond Corporationâ€™s Ekati mine and Rio Tintoâ€™s Diavik mine established the Grizzly Bear DNA program in the Northwest Territories in 2012. The large-scale study encompasses a 16,000 km area around the two diamond operations and will help determine if mine-related activities influence the relative abundance and distribution of grizzly bears over time. Hair samples are collected and submitted for DNA analysis. The compilation of results in consecutive years will help provide an accurate snapshot of the baseline population study area. The program will be repeated every three years to compare population levels with this baseline to identify trends, such as population growth/decline, size of home range and emigration/immigration of new animals. This project, which combines scientific research and traditional knowledge, is the largest grizzly bear DNA program in the territory. It was also the first major collaboration between diamond mines in the region. 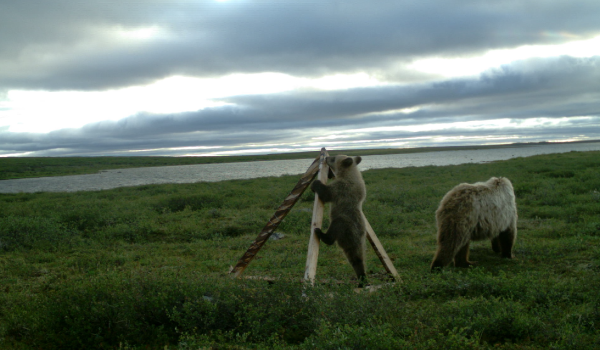 Since the Ekati and Diavik mines started this program, De Beers is also conducting Grizzly Bear DNA programs at the Snap Lake Mine and Gahcho KuÃ© Project. In the boreal forests of Northern Alberta where Syncrude has a large oil sands mining operation, fen wetlands are commonplace and, in nature, can take thousands of years to establish. 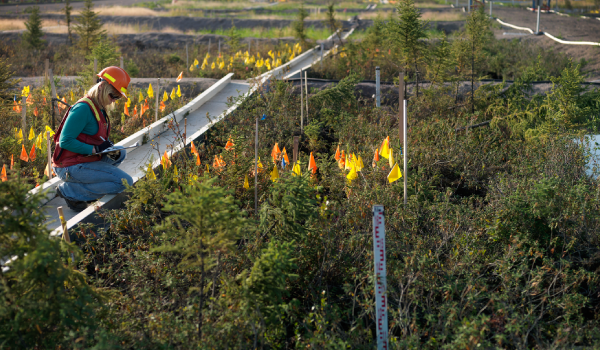 This peat-forming, groundwater-fed wetland became Syncrudeâ€™s source of inspiration as it looked to transform a tailings structure into a thriving wetland in 2007. With very little information on fen reclamation to refer to, Syncrude established the interdisciplinary Sandhill Fen Technical Advisory Panel to create something that had never been done before, and the Sandhill Fen Research Watershed Initiative was born. The watershed was developed on 52 hectares of sand-capped soft tailings on a portion of what was once a 60-metre deep mine. In all, more than 28 kinds of wetland plants were introduced and vegetation was selected to mirror those in naturally-occurring fens in the area. Construction of the watershed was completed in 2012 and will be closely monitored over the next 10 to 20 years. This project is still in its early years, but results are extremely encouraging. For example, peat studies show that it is possible to transplant live peat from a natural environment and grow it in a newly- constructed area. Additionally, a number of native plants have successfully taken seed and are growing on their own without having been planted. The information being gathered is invaluable towards improving wetland reclamation best practices for Syncrude and the oil sands industry as a whole. Managing risks to waterways is critical to mining operations and the communities that rely on them. Valeâ€™s Voiseyâ€™s Bay operation in Newfoundland and Labrador, in partnership with the provincial government, set an industry best practice through the Real Time Water Quality (RTWQ) Monitoring Partnership â€“ a program that provides near real-time (four hour delay) information on water quality of various streams within the vicinity of the mine and mill. Through this project, water quality data is uploaded via satellite link from four solar-powered stations and can be read online by the public. 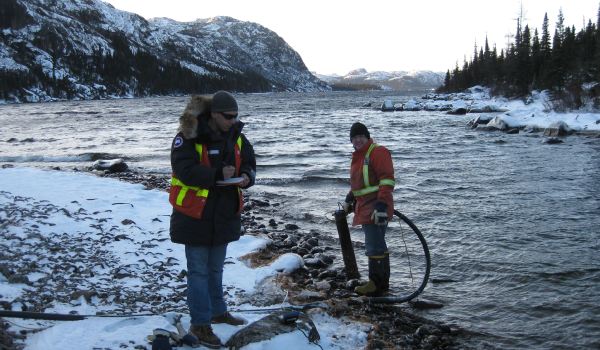 The information is used by community members to enhance traditional knowledge as the water stage, flow measurements and water temperature can help predict the migration patterns of Arctic Char. Moreover, the provincial government can use the data to inform regulation development, when necessary, and aid in site-specific risk assessments. In 2003, Vale was the first industry partner to sign on to the RTWQ. In 2012, the partnership was extended with Vale providing more funding and equipment to the program. Data is available since the beginning of mining activities in the area and, in 2012, Vale and the provincial government committed to conducting a thorough review of all years of data. 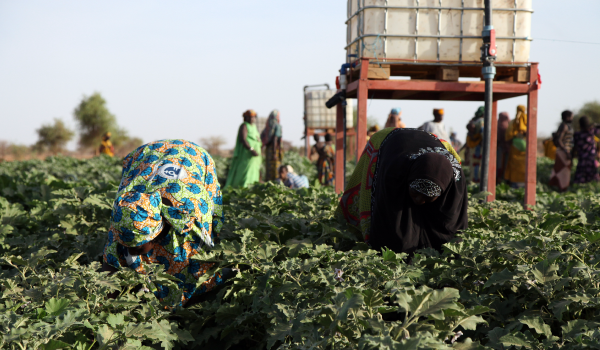 The populations around IAMGOLDâ€™s Essakane mine in the semi-desert Sahel region of Burkina Faso are dependent on trees for firewood, food, feed for livestock and traditional medicine. With trees having to be removed to construct the mine, IAMGOLD launched a reforestation program in 2009 to compensate for the loss to local biodiversity and made a goal of 100,000 living trees by the time it ceases operations. The project emerged directly from exchanges with the local community, and residents were involved from the planning stage through to implementation. To ensure that the plantations flourished, IAMGOLD trained groups of women in nursery techniques. The program demonstrates the positive outcomes that can result from a mining company and communities working together, with the initiativeâ€™s success largely attributed to its participatory and community-driven process. 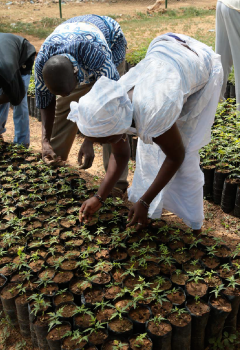 Since the program began, more than 200,000 trees have been planted. Forest areas when the mine ceases operation are expected to be comparable or superior in terms of size, quality and function to those existing on the mining site prior to construction. There is also expected to be a 30% increase in the number of trees considered threatened, rare, endangered or protected in the project zone. Situated in the Nunavik territory of Northern Quebec, Glencore Canadaâ€™s Raglan mine has made it a priority to attract and retain as many local Inuit employees as possible. To achieve this goal, Glencore launched its Tamatumani program in 2008, meaning â€œsecond startâ€ in Inuktitut, which has helped the company increase Inuit employees by 170% and reach a retention rate of 80%. Built in collaboration with community partners, the program encourages career development of Inuit employees, provides technical training and basic skills training, and supports the integration of new Inuit staff. As part of the initiative, the company created the Inuit Employment Centre, which manages the entire staffing process, maintains a bank of candidates interested in working at the mine and visits Nunavik communities to ensure residents are aware of available positions. In 2013, Glencore created a new program called RIDE (Rapid Inuit Development and Employment) to complement the Tamatumani program to encourage internal mobility for Inuit employees with high potential. The RIDE program provides personal career development plans, and has developed partnerships with educational institutions to offer Inuit students scholarships, summer jobs and internships. Since the founding of the program, 85 positions have been created for Inuit workers for nearly 30 different types of jobs. In the Sahel region of Burkina Faso, home to IAMGOLDâ€™s Essakane gold mine, the climate is desert-like, often reaching 45 ÌŠ C with very little rainfall. Populations largely rely on livestock breeding and gold mining for their livelihoods. To improve security and combat poverty in the region, IAMGOLD committed to develop alternate revenue sources for communities living near the mine site. Working with communities of interest, market gardening emerged as an opportunity to broaden revenue sources, while at the same time improve food security and nutrition. In 2009, 100 women from the relocated 500-member Marganta community adopted the practice using a solar-powered well and water storage system provided by IAMGOLD. This innovation has greatly lightened the womenâ€™s workload and has allowed them to water garden beds without worrying about a lack of water. Two years later, drip irrigation technology was added, which has helped increase production without increasing water use. Vegetables can now be cultivated year-round, increasing the number of harvests to two to three per year instead of just one. Since 2009, nearly 400 producers (more than 50% women) have earned additional revenue through market gardening, and many have doubled their annual income. Whatâ€™s more, there has been an increase in people choosing gardening over gold panning. The projectâ€™s success has also generated much interest by neighbouring villages and other mining companies who would like to replicate it in other regions. The region of Labrador West â€“ comprised of Labrador City and Wabush â€“ is a good example of how mining can create modern towns. As towns develop and grow, however, they can experience pressures like rising housing and transportation costs, a lack of social services and infrastructure, and difficulty in attracting and retaining skilled employees. 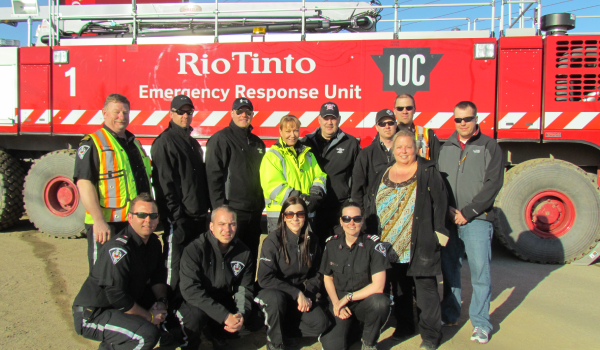 In 2006, the Iron Ore Company of Canada (IOC), a division of Rio Tinto, sought to address some of these pressures by establishing a Community Advisory Panel â€“ a grassroots group that acts as a consultative forum for the company. Originally intended to focus on only on Labrador City, IOC decided to broaden the Panelâ€™s scope to cover the entire Labrador West region in light of rapid growth resulting from development in the Labrador Trough. The Panel is currently co-chaired by IOC and Cliffs Natural Resources, and meets regularly to share information and develop solutions that will benefit local communities. In 2012, IOC took one step further by creating a Regional Task Force to complement the Panelâ€™s efforts. The task force can escalate issues to the government when needed and includes senior executives from IOC, Cliffs Natural Resources and other mining companies, along with senior municipal and provincial government officials. Together, these groups have generated positive results for the region, including advocating for affordable housing, working to ensure the region has appropriate health and emergency services and community infrastructure, and partnering with colleges to improve education and training opportunities. Established as a mining community in the late 1950s, the City of Thompson has become a regional service hub and gateway to Northern Manitoba. However, economic volatility and the fact that Vale will reduce its operations with the closure of its smelter and refinery by 2015 have underlined the need to broaden and diversify the areaâ€™s economic base. Five years in advance of the partial decommissioning, Vale proactively engaged and fully-funded rePlan to co-launch the Thompson Economic Diversification Working Group (TEDWG), which developed action plans for economic development and diversification over the projectâ€™s two-year lifespan. 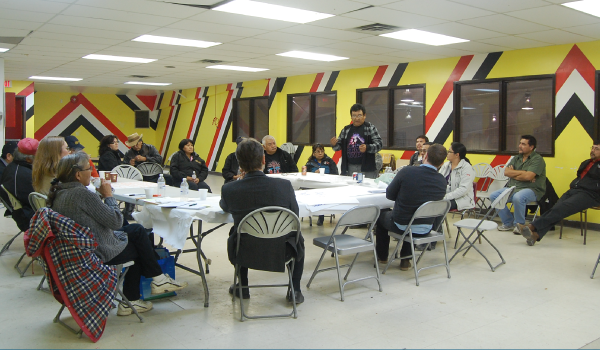 The group was highly collaborative, involving representatives from the Keewatin Tribal Council, Manitoba Keewatinowi Okimakanak, Nisichawayasihk Cree Nation, the City of Thompson, the Manitoba MÃ©tis Federation, Thompson Chamber of Commerce, and others. Communities helped to set all of the groupâ€™s priorities, which were focused on addressing economic, social, educational and health aspects and barriers. The groupâ€™s actions plans have now transitioned to community groups and stakeholder organizations for implementation. The process represents unprecedented levels of community and stakeholder engagement funded entirely by a mining company nearly five years in advance of a partial decommissioning project to ensure sustainable economic development in the community. 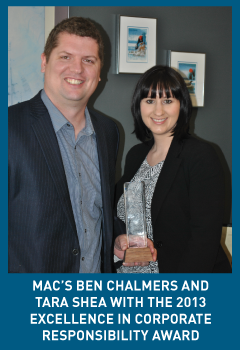 Established in 2004, MACâ€™s award-winning TSM initiative is now celebrating 10 years of driving performance at mining operations across Canada and beyond. Over the years, TSM has reached many important milestones and has been recognized by reputable organizations with awards and accolades for its impact in the Canadian mining industry. TSM has been recognized with awards by the Globe Foundation (2005), the Prospectors & Developers Association of Canada (2012) and the Excellence in Corporate Responsibility Awards (2013), the latter sponsored by a group of highly-reputable sustainability experts including Green Living Enterprises, the Canadian Business for Social Responsibility, CIRAIG (Interuniversity Research Centre for the Life Cycle of Products, Processes and Services), The Natural Step Canada, Jantzi-Sustainalytics, Corporate Knights, Pembina Institute, SustainAbility and Bob Willard. TSM has been successful in pushing for continuous progress in the mining sector. The proof is in the results, which have seen steady improvement over the duration of TSM. For a detailed look at the latest facility-level results, download the 2013 TSM Progress Report at www.mining.ca. The Paul Stothart Memorial Scholarship in Mineral Economics is now in its second year. The scholarship, valued at $3,500, was established in 2012 from the generosity of MAC member companies in memory of the late Paul Stothart, MACâ€™s former Vice President of Economic Affairs. The scholarship will be awarded annually to a Canadian university student who shares a similar passion and talent for mining finance as Paul had. Qualified candidates must be studying either a Bachelor or Master of Economics, or a Master of Business Administration at a Canadian university. Students can submit their applications until May 15, 2014 and the scholarship will be awarded for the 2014-2015 school year. For more information about the scholarship and eligibility, please visit www.mining.ca. National Mining Week complements other provincial mining weeks that take place across the country throughout the year. Together, these weeks help to underscore the mining industryâ€™s fundamental role in our national economy and in virtually all regions of Canada. Mining contributes more than $52 billion to Canadaâ€™s GDP and accounts for 20% of total goods exports. Mining companies pay billions of dollars in taxes and royalties to Canadian governments each year. In 2012, this figure amounted to more than $6.6 billion. Approximately 400,000 people are employed in mining across Canada and a projected 145,000 new workers will need to be hired over the next decade to replace retirees and fill new positions. Our nationâ€™s mineral production value in 2012 reached $47 billion and Canada ranks among the top five producers of potash, uranium, aluminum, platinum, diamonds and nickel. Itâ€™s important to note that the Canadian mining industryâ€™s current contributions and presence in Canada cannot be taken for granted. Canadaâ€™s strength in the mining industry â€“ and the jobs and economic contributions that go along with it â€“ are not a given. Canada is only one of many attractive countries to mine or to list, and the industry needs the right economic and regulatory ecosystem to thrive. To learn more about the Canadian mining industry and its contributions to Canada and abroad, read our Facts & Figures 2013 Report at www.mining.ca. 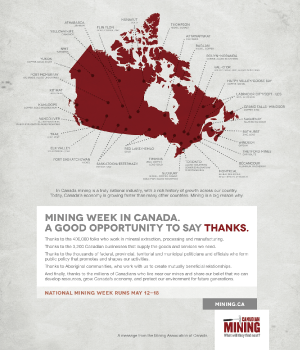 More information on National Mining Week is available on NRCanâ€™s website at www.nrcan.gc.ca. Copyright Â© 2014 Mining Association of Canada, All rights reserved.